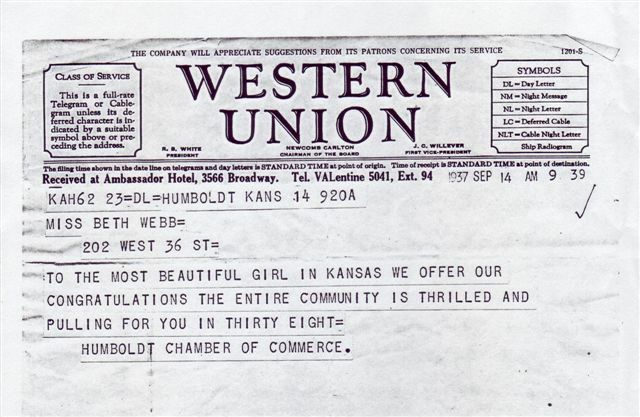 Beth Webb was born and raised in Humboldt, Kansas, the daughter of the town's doctor. Dr. Herbert Webb was caring for soldiers on the front lines of WWI in France when Beth was born, and did not immediately learn of his wife's death, six months later, during the flu epidemic of 1918, until a friend's condolence letter arrived at his medical post. Beth was raised by her dad, attended Iola Junior College and after the Miss America pageant lived and worked in Kansas City. She was a stenographer and modeled during her off time. She married Jack Jeffries of Joplin and they had three daughters. She was a stay-at-home mom while Jack was away during WWII. After that marriage ended she lived and worked in Jefferson City, Mo, the first of many years of working for the MO State government. Her marriage to Joseph McLaren produced three more daughters and lastly, a son! Beth's career during her last 20 years of employment was as assistant to a judge in the Missouri Supreme Court, and later a judge in the Missouri Court of Appeals. Her retirement finds her still active, as she approaches the age of 90, attending and working for Shepherd's Center of Kansas City, an organization which enables mid-life and older volunteers to share their talents, skills and wisdom for the good of their peers and the community. Blanche Elizabeth "Beth" McLaren, passed away on Thursday, November 29, 2012 at St. Luke's Hospital, Kansas City, Missouri. 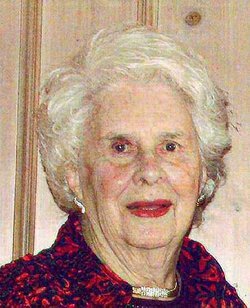 Beth was born on November 10, 1917, in Humboldt, Kansas, the daughter of Blanche Fowler Webb and Dr. Herbert Melville Webb. 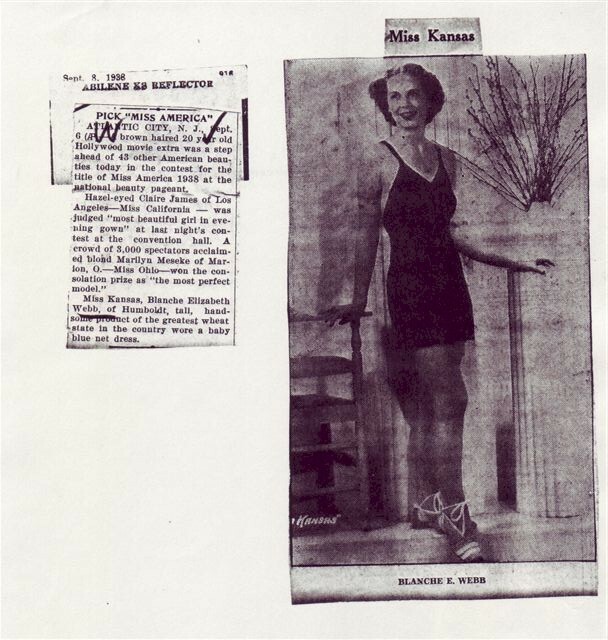 She graduated from Allen County, Kansas Community College (formerly Iola Junior College) in 1937. 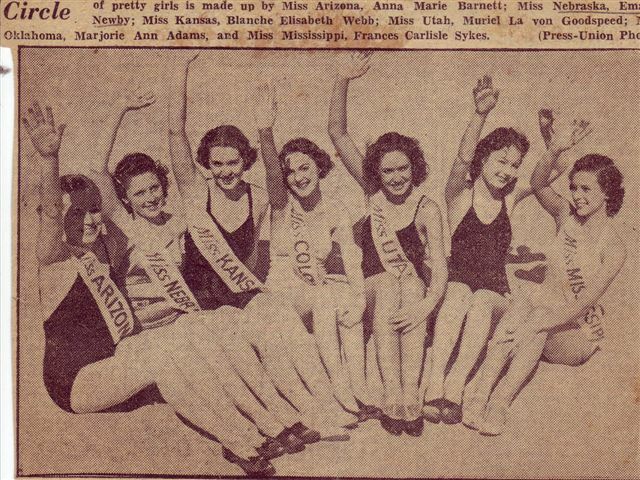 Beth was selected to represent the state of Kansas as Miss Kansas of 1938 at the Miss America pageant in Atlantic City. 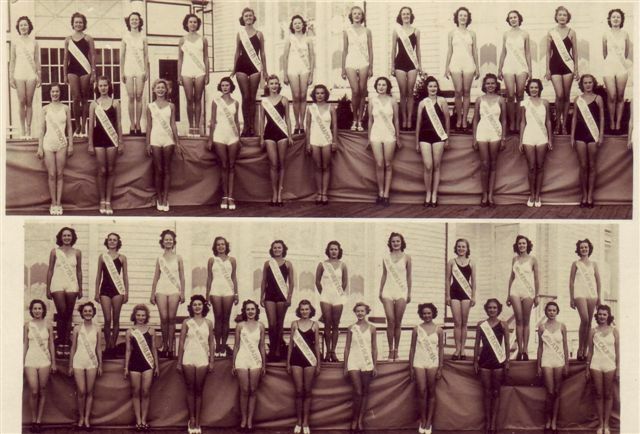 Following the Miss America pageant, Beth lived and worked in Joplin, Jefferson City and Kansas City. She married Jack Richard Jeffries of Joplin and had three daughters: Jane Jeffries Silver of Kansas City; Sally Jeffries Etchepare (husband Raymond) of Carlsbad, California and Anne Jeffries Wold (husband Richard) of Rancho Palos Verdes, California. In 1950, Beth married the late Joseph Paul McLaren, and later divorced. Their children are Susan McLaren Gifford, Janet Bridget McLaren , Teresa McLaren Hickam (husband Robert) all of Kansas City, and James P. McLaren (wife Elizabeth) of Lexington, North Carolina. She has 11 grandchildren and 12 great grandchildren. Beth was predeceased by one sister, Jeanette Webb Pendarvis in 1993, and one brother, Herbert M. Webb, Jr., in 1977. Beth was employed in Jefferson City as a teacher in the adult night school and as secretary to Judge Fred Henley of the Missouri Supreme Court. In Kansas City she was secretary for 11 years to now-retired Judge Charles Shangler in the Missouri Court of Appeals in Kansas City, MO. Beth was a longtime member of Central United Methodist Church, its Crusader's Sunday School Class, and Joanna Guild; and Shepherd's Center of Kansas City, Central.